Tried and true glass etching techniques help turn ordinary household items into beautiful works of art. If you're interested in making decorative glass projects, you'll want to learn the etching secrets that masters of the craft have used for decades. Artistic etching is the technique of creating works of art on the surface of glass. 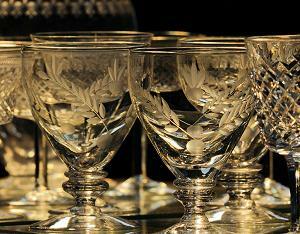 Depending upon skill level, there are several techniques useful in the art of etching glass. Materials needed for etching include stencils, patterns, etching gels, creams, and acids, as well as personal sandblasters. You can purchase these items in many craft stores and on the Internet. There are also several etching kits on the market that supply everything you need to etch designs into glass. Due to its speed and ease of use, surface etching is the most common way to create etched glass designs. This method gets its name from the process itself, which involves transforming only the surface of the glass using one of several easy methods. After the process is complete, the design looks two-dimensional with the etched areas of the glass taking on a frosty, white appearance. Surface etching is achieved by using glass etching creams and gels, acids and other abrasive liquids, and consumer sandblasting kits. The real trick to this technique is the learning how to create contrast between the etched surfaces and the unetched surfaces so that the design doesn't blend together and become unrecognizable. Shading and surface etching are similar glass etching techniques with a couple of major differences. Shading affects the surface of the glass, similarly to surface etching, but shading techniques allow the density of the etching to vary, which gives the item much more detail than can be achieved with the first method. Designs that have been shaded into the glass produce various hues of gray to suggest shadow, light, and layers of depth. Another difference between surface etching and shading is that areas of glass that have been shaded can touch one another with less risk of losing the design in the etching process. Glass shading uses the same creams, gels, and equipment that is used for surface etching. Of all etching techniques, this one is the most complicated. Unlike shading and surface etching, carving occurs deep below the surface to produce a three-dimensional work of art. The term carving encompasses three methods called multi-stage, single stage, and freehand. Single stage is the easiest form and is simply the act of blasting deeply into the glass's surface. This stage usually requires that you manually achieve the separation of design elements by leaving unetched spaces embedded in the design. Multi-stage carving involves removing glass at various depths in order to achieve a three-dimensional bas relief carving. As the name suggests, freehand carving occurs without a predesigned stencil or pattern. It helps to have an artistic background for freehand carving, although many artistic abstract designs are achieved without any training. Carving usually involves sandblasting but in some cases can be accomplished with creams and acids. Once you've learned how to accomplish all three glass etching techniques, consider moving on to mixed methods. Combining techniques allows you to create original and sophisticated works of art to pass on to friends and family. It's a good idea to start with small practice designs before moving on to more complex patterns. It's easy to get glass etching supplies. Visit your local craft project supply store or check out the links below to get started. Glass Etching Kits: Here you can buy stencils and patterns, or kits that even include a piece of glass upon which to work. Glass Crafters: From stencils to sandblasters, Glass Crafters has it all in a single, easy-to-use location. Etch World: Specializing in stencils and etching creams, Etch World can help beginner glass etchers learn the art form. Glass Etching Secrets: In addition to a large amount of information about glass etching, this site offers free etching patterns to download and print.